While not much remains of our earliest days, there is some evidence that our oldest ancestors had rudimentary forms of art. Most of what remains today are broken pieces of a time long gone in the form of fragments of tools, pottery, and ruins of burial grounds and sacred sites. Paleolithic man knew the birth of everything important to our comfortable survival from dwelling places to the utilitarian convenience of tools. He also established the foundations of decorative art. There are two simultaneous art movements in Paleolithic art that denote location and discovery, both beginning in 14,000 BC. There are, of course, older examples of crafts and tools and very simplistic representations of figures, but these two periods see a higher development. The Aurignacio-Perigordian includes the Venus of Laussel, a curvy and sensual rock carving of a long haired woman found in France, and other more voluptuous Venus statuettes. The Lascaux caves of France feature paintings of bulls with sophisticated talent. The Solutreo-Magdalenian period includes the Cave at Altamira, Spain that shows finely detailed bison and deer with silhouetted hunters in headdress. The labyrinth like cave at Rouffignac shows us what the wooly rhinoceros looked like as well as mammoths and bison. Niaux Cave in the French Pyrenees is a deep complex that includes an image of a weasel, a set of footprints, and rock engravings of fish amongst other things. 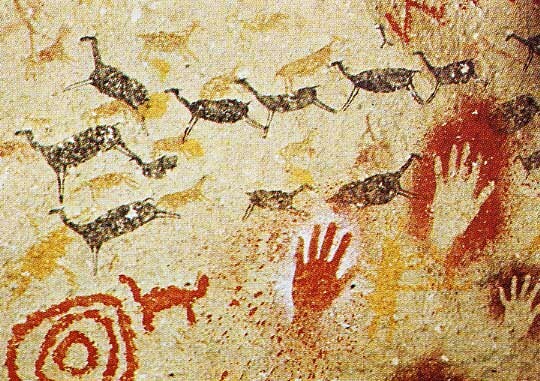 Painting in the Paleolithic era was done with various tools and mediums. Some artists daubed or stippled with moss or fur, others used their finger or sticks in the way that we use brushed, and others used colored rocks, chalks, and charcoal to draw. One innovative technique was to blow color through a hollow bone or to spray it directly from the mouth. A fair use of pigments was used to create these painting and artists had a good grasp of creating depth with shadowing. The cave paintings were not all done at once in any one location, but were done at separate periods in time with respect in space for the earlier pieces of art. Subjects like those at the caves mentioned above ran mostly to animals of varying types, mainly those that were hunted. 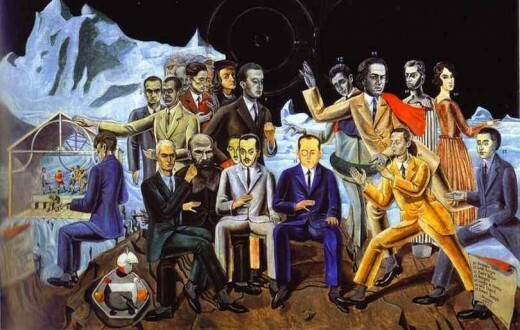 Humans do figure in the art, but were not common. It is thought that the caves may have had ritualistic use, as signs of human habitation are sometimes absent. Other reasons scholars think these may have be religious or ritualistic sites are the presence of etched stones, reliefs, and freestanding sculptures near the caves and sometimes inside them. Other etchings were done on ivory and other animal bones. Other famous cave sites have been found in France, including those at Grotte Chauvet where a very many paintings have been found dating as far back as 32,000 years. These paintings, and additionally, stone engravings, are realistic in nature and include various animals that would be considered exotic in France today such as more rhinoceroses, bears, and lions. German sites from the same period have produced animals and birds carved from ivory. 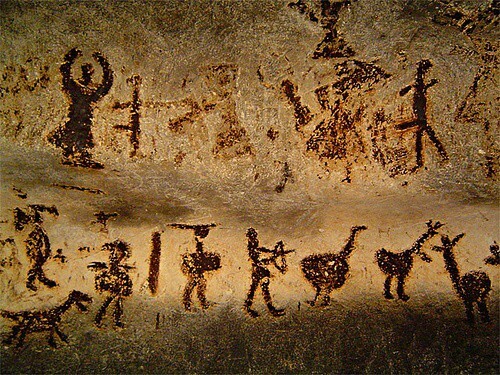 The oldest cave art discovered to date is that of a single red dot found in a cave in Spain at El Castillo. It is near more recent hand stenciling (which is still quite old at 37,000 years) and dates to 40,800 years ago. The red dot may have been left by Neanderthals, but the dating of the dot coincides with the first human habitation in Europe. Eastern Spain is home to shallow rock shelters that contain silhouetted pictures of hunting scenes, rituals, fighting, and everyday life. Humans are depicted here in addition to the animals. 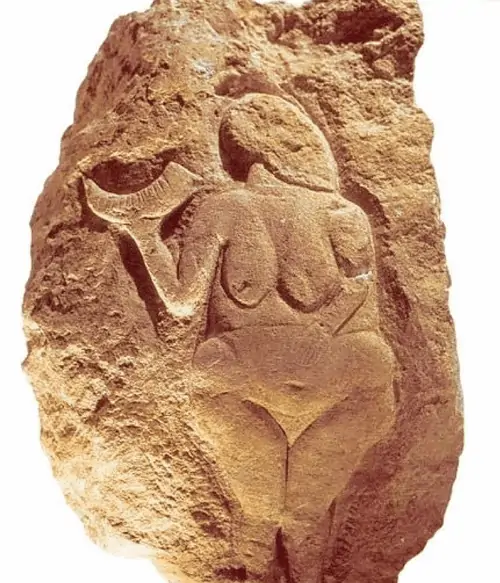 Aurignacian artistic styles also run from France into Western Siberia and it is from these that we get the Venus of Willendorf, one of the most famous fertility statuettes of the period. She is characterized by her large, soft body and pendulous chest. This culture also sculpted other human female figures and some males, as well as animals. The Venus and other female figures are thought to be goddesses of fertility. The oldest Venus type goddess statue was found in Germany and may be as many as 35,000 years old. Some Paleolithic art is found in the British Isles, but most of it has deteriorated or been lost due to the damp climate and changing shorelines. The earliest stone carving (dating to 14,000 years ago) on the Isles is a one of a reindeer that has been hunted and speared that appears on the wall of a cave in Wales on the Gower peninsula. Another early work is located in Derbyshire at Creswell Crags. There two carvings of birds that may or may not be identified as swan, crane, or birds of prey, were carved into the crags over 12,000 years ago. 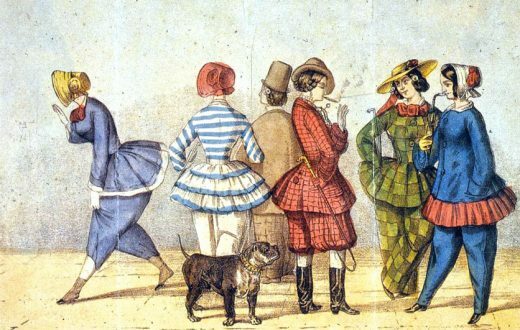 While they are somewhat similar in style to the continental artists of the time, they are not quite as old and are not as sophisticated or well rendered. The caves at Pech Merle in France were a series of underground channels created by an ancient river that were inhabited by humans and later as a space for mural painting. It is on these cave walls that whimsical dotted horses, hands and feet created by painting around them (sort of reverse prints), and wooly mammoths were found by two teenage boys exploring the caves with their father in the early 1920s.